I'm back! Thanks Big C, for covering for me while I was busy making boring "grown-up" food (chicken cordon bleu, crab-stuffed pork loin, and chicken tikka masala in case anyone was wondering :)). 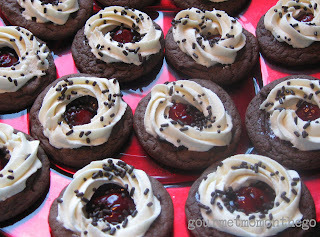 I made up these little cookies last week for a "cake mix bake-off" with some girlfriends, they were delicious! They're perfect for parties and look beautiful wrapped up on a plate as a gift. 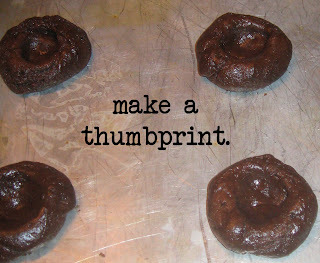 Even better, you can make them in a snap! 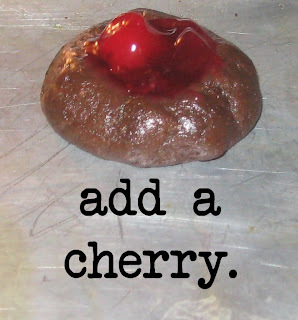 note: this recipe uses about half the can of cherry pie filling, so I usually double it and use the whole can. Preheat oven to 350 degrees. 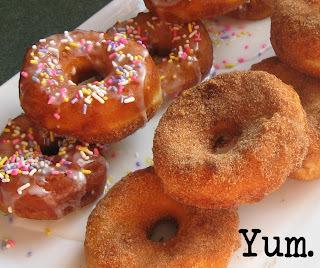 Mix cake mix, egg, and butter in a medium bowl until well blended and stiff dough forms. Roll into 1" balls and set on greased cookie sheet. With your thumb, make an indentation on each ball. 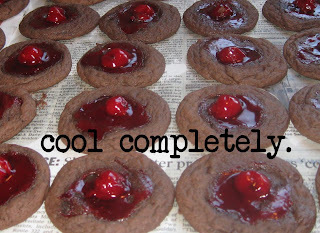 Open pie filing and place one cherry and a bit of sauce in each cookie's indentation. Bake for 8-10 minutes until just set. Cookies will spread when baking. Cool completely. Put frosting in a pasty bag with a star tip (or a ziploc bag with the end snipped off). 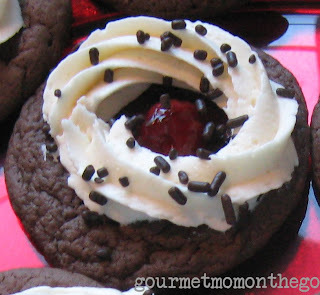 Make a circle of frosting around the cookie's center and garnish with sprinkles. Yum! Cream butter until smooth. Add about 1 c. sugar at a time, alternating with a little milk. Blend well. If stiffer icing is needed, or if the weather is very warm, add a little extra sugar. This recipe is enough to cover and fill a 9 by 13-inch sheet cake or 2 (9-inch) layers. 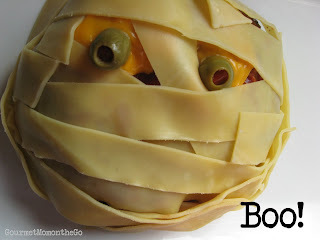 We're getting into the Halloween spirit around here and I found a half-open box of lasagna noodles in the pantry, so we decided to dress up tonight's meatloaf. The result was spoooooooky! Preheat oven to 350 degrees. Cook lasagna noodles according to package directions. 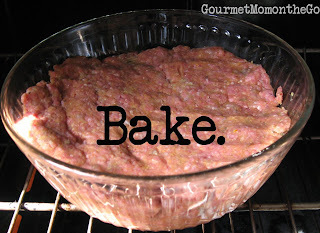 Mix all meatloaf ingredients well in a large bowl. Press into a glass bowl (make sure it's ok for the oven) and bake for 60 minutes or until center is done. When completely cooked, Drain any fat off the meatloaf and turn onto a serving pan. Spread with a thin layer of ketchup, if desired. 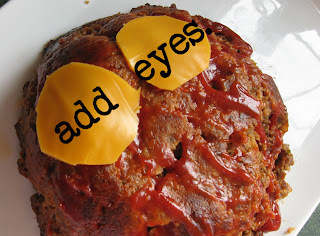 Cut cheese slices into circles and place on meatloaf as the "eyes". Add two olives for eyes and serve! I saw a big cheeseball pumpkin in a magazine and thought, "how about mini ones for party appetizers or after-school snacks?". We whipped up a batch today and they were gobbled up! 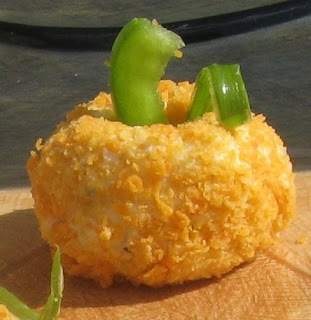 Use any cheeseball recipe you like, we just picked something easy since my kids are big Ranch fans. These would be absolutely adorable at a Fall Party!!! Mix cream cheese, ranch dressing mix, and shredded cheese in a bowl until combined. Take a heaping spoonful, roll it into a ball shape and roll in crushed cheese crackers. Serve with pretzels, carrots, crackers, pea pods, whatever your family likes to dip. 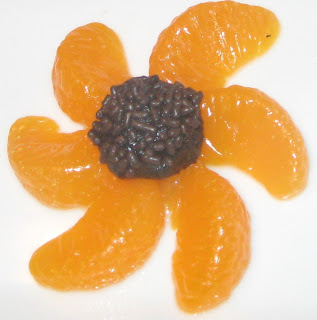 I used the melon baller and some fruit for a fun, flowery presentation. I decided to surprise the kiddos and served them for breakfast. The response? "Dessert for Breakfast?! Mom, you are going crazy today!". They were a hit. Preheat the oven to 300°F. Spray or butter an 8 by 8-inch pan; set aside. In a large, deep bowl, combine the beans, sugars, nuts, butter, baking powder, and salt. Using a stick blender or food processor, start to work the ingredients around. When they are fully blended, add the eggs and blend to combine. Pour the mixture into the prepared pan. 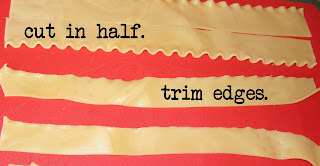 Bake for 30 to 40 minutes, until firm and the edges get slightly crisp. Cool and cut into small cubes or take a spoonful and roll into small balls in your palms. Dust with powdered sugar or sprinkles. Store covered, up to 5 days in the refrigerator. • Substitute white beans, pintos, or adzuki beans. They can be found in the ethnic aisle of your store. The texture and color may change, but the idea stays the same—a cake made of beans! • Add a tablespoon of orange zest, try different kinds of chopped nuts, or add dried currants after blending for a chunkier texture. Hi Friends, I'm back and in the kitchen! Gourmet Dad and I had wild, fun, romantic, crazy vacation in...Costa Rica! We went all around the country but stayed for a few days at the base of the Arenal Volcano and had fun watching it errupt at night. Anyway, while we were gone I left a special dessert for the girls to have...Erupting Volcanoes! 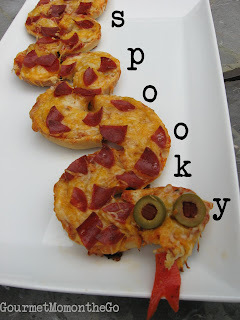 These would also be a fabulous "V" treat for preschool! Spread melted chocolate on the outside of the ice cream cones...let the kids do this part, the messier the better! Place on wax paper to dry. If you are using candy melts for the lava "explosions", melt a small amount in a bowl, place in a plastic baggie, snip the end, and draw a few squiggly lines on wax paper. Let set completely. If you're using licorice, simply seperate the licorice strings and snip to various lengths (or let everyone eat their own to various lengths:). Put butterscotch ice cream topping in a bowl and tint with red food coloring to make your lava. When cones are dry, fill with your favorite ice cream, just to the top of the cone. Place upside down on a plate and carefully cut off the top inch or so of the cone to resemble a volcano. Get your butterscotch "lava" and fill the top and drizzle some down the sides of the cone. Place candy melts (or licorice strings!) in the top to resemble and explosion. Optional: Put come coconut and green food coloring in a baggie, mix well to tint the coconut. Place around the base of your volcano to resemble grass along with a few candy rocks. I hate to leave, but hunky Gourmet Dad and I are escaping.....alone! We'll be back on the 15th. I'm not telling you where we're going (we don't want the kids to find us. ha!) until we get back, but here's a clue: When I get home, I'm going to show you all how to make Frozen Erupting Volcano Desserts! Yowza! to everyone who voted for me in Iron Cupcake: Earth! I came in second place and I actually was edging up on that fabulous and famous Bakerella! I'm glad she won, she's an amazing chef, heck, she's been on Martha Stewart! I'm just happy I came close and I really felt the love! Thank you to everyone who voted! While Big C was at school today, Little C and I cleaned the kitchen light fixtures (Mom, are you still breathing?). 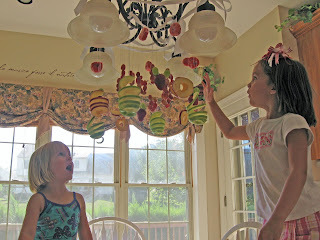 I also thought it might be fun to start teaching her basic sewing, so we combined everything to make an edible Chandelier Sculpture! Big C couldn't believe her eyes when she saw this luscious after-school snack! This would be a fun rainy-day afternoon project, I'm sure we'll do it again with everyone. Clean light fixture thoroughly. Tie ribbon, string, or place coat hangers on fixture to create a base for your creation! Using a Sterilized needle, thread several pieces of fruit on a dental floss string. Tie ends together. Hang on your light (see video). Keep threading fruit (and doughnuts in our case:)) and hanging until you're creation is complete! 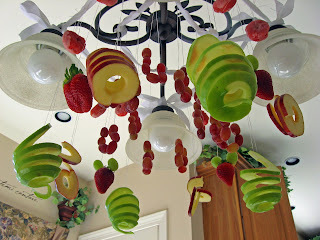 NOTE: If using apples, dip them in a lemon juice/water mixture or pineapple juice before hanging. This will help keep them from turning brown too quickly. Let the kiddos cut them down and enjoy!! My girls call this "Funny Fruit". It's super easy and always disappears about as quickly as I can make it!